Training in cold weather has many benefits; you burn extra calories as your body uses up more energy to stay warm. In fact, the total energy expenditure for 60 minutes of exercise was 13% higher in a cold environment, according to the Journal of Medicine and Science in Sport and Exercise. As a result of burning more calories, you’ll find that you can consume more calories, but not gain any weight. Exercising in the cold will also help to improve your performance as the conditions, i.e. wind resistance, are more challenging. It can also boost your immune system by increasing lymphatic and cardiovascular circulation. In addition, it produces mood boosting hormones, helping you fight Seasonal Affective Disorder. However, cold weather training can also be hard on your body, which is why it is important for you to take precautions in order to avoid getting injured or falling ill. So, if you are thinking of working out in the cold, check out our tips below to make sure you keep your performance level high and injury-free. Warming up before your training session is a must at any time of the year but you will find that during the winter your body takes longer to increase its temperature. Not warming up properly can result in injury as your muscles, joints and ligaments can go into shock. In order to avoid this, add an extra 5 minutes to your usual warm up routine when training in cold weather; start off gently by waking up your body with some stretches and then move onto a more dynamic warm up to increase blood flow and activate your muscles. Underestimating the temperature outside is easily done, especially if you have been indoors all day. However, you can also take the bundling up too far and end up being dressed too warmly to work out. In order to avoid either of these scenarios, the best option is to keep the “onion principle” in mind and layer up. Wearing layers will allow you to remove clothes as you warm up in order to prevent overheating and to easily add layers as you start cooling down. Another good tip for training in cold weather is to make sure that your extremities are covered, as they are the ones more exposed to chill than normal. Wearing gloves, thick socks and a hat or earmuffs should help keep your limbs warm. Drinking fluids may not seem as necessary when training in cold weather however, dehydration knows no season. Training in the cold challenges your body to work harder so it’s very plausible that you are going to be sweating more than usual and therefore losing more fluids. Make sure you drink plenty of fluids before, during and after a workout to stay well hydrated. If drinking icy-cold water isn’t very appealing then try drinking lukewarm water; which will also soothe your throat after your training session. During the winter, daylight hours are few which means that you will probably be training in the dark. In order to stay safe, wear bright colours, fluorescent gear and a head torch so you are visible to other people, cyclists and drivers. Icy roads are also very common this time of year, posing a big risk of injury so training in a park or trail is a safer option. 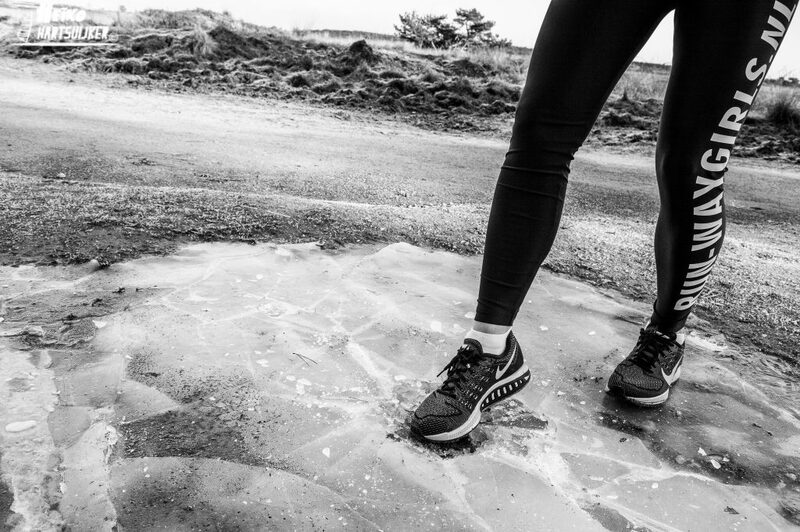 If you train around your house, using some salt to de-ice the road prior to your workout is also a good option. Your body is at its most vulnerable in the first half hour after working out, which makes it very susceptible to infections and colds. Getting into the warmth and removing your sweaty clothes straight after finishing training will help you avoid getting ill. Even in winter, low-sodium levels can cause dehydration, muscle cramps or even organ failure. On top of that, salt is critical to performance too. When sodium levels get too low, total body water drops and blood volume decreases, which leads to fatigue and performance declines. Salty sweaters need to increase consumption of healthy high-sodium foods, such as pretzels, peanuts and soups to preserve sodium levels.